Educate yourself. Do you know the signs of a concussion? Do you know how to tell if your child is suffering from dehydration or heat exhaustion? These days, the first place most parents look for information on pretty much any injury is “Dr. Google,” but Googling a health-related topic can be an overwhelming experience fraught with inaccuracies and misinformation. For concussions, the only resource you should use is the CDC’s Concussion in Sports site. To-date, 43 states have enacted laws about concussions and return-to-play protocols and 12 more have pending legislation. For other sports-related injuries, the national organizations of two specific sports, USA Football and USA Hockey, have safety sections on their websites. Unfortunately, I found the most popular national soccer and baseball organizations sorely lacking in similar information. Their idea of ‘player safety’ is background checks of coaches. While that’s necessary, it’s clearly not enough. Leagues must realize that they are liable if a child sustains a concussion and continues to play. A groundswell of parental pressure could change that. Are you ready to effect change? Hold your league or school accountable. How safe is the league for which you’re signing up? 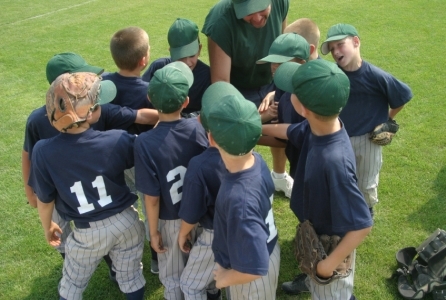 What kind of training does your league or school require of coaches? Is it only skills-based or does it include safety, CPR, first-aid, and concussion training? Does your league or school have a safety coordinator? Do they have a published concussion protocol? Is it part of the parent ‘Code of Conduct’ packet you sign at the beginning of the season? If not, don’t register for that league. Find another one that meets your safety requirements. Or talk to the league board or school athletic director and insist on written protocols. Better yet, lead an effort in your league or school to put these protocols in place and get coaches trained correctly. If the shoe doesn’t fit, don’t wear it. We all know times are tough and money is tight, but one place you really shouldn’t skimp is on properly fitting athletic equipment. Ill-fitting equipment is a major contributor to many avoidable sports injuries. Is it really worth it to give your 8-year-old his older brother’s well-worn batting helmet and risk it not protecting your child’s precious head? Or not buying new cleats for your growing soccer player, risking a foot injury or worse? In football and hockey, poorly fitting helmets can mean the difference between a routine play and a traumatic brain injury. USA Football even has a video on its site to help you fit your child’s helmet correctly! Get thee to a specialist. Your pediatrician or an ER doctor is typically the first medical professional to see your child after an injury. While pediatricians and ER docs are great at diagnosing general injuries, most are not specifically trained in traumatic brain injuries and concussions – or in return to play protocol. Don’t be afraid to ask if they feel comfortable monitoring your child through the recovery process and if not, request a referral to a specialist in the specific area of injury. 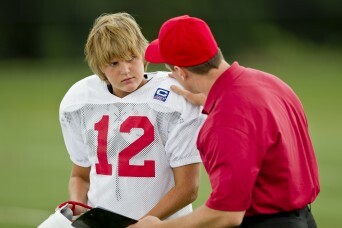 This specialist can be the difference between a full recovery and an injury that cuts short your child’s sports career. Use peer pressure as a positive. Peer pressure is typically viewed as a negative: children pushing each other into activities that aren’t healthy or safe. But when it comes to concussions or other sports injuries, peer pressure can be a positive thing. Often, coaches don’t see an injury on the field and an injured player is loathe to let the coach know: “I’ll lose playing time.” Encourage your athlete to let coaches know when another player doesn’t “look right” or is “acting funny.” That peer review could come back and help your athlete stay healthy in the long run. Take a deep breath. All the hysteria and hype about injuries – especially concussions and TBIs – can make you question the value of playing sports. Do the positives really outweigh the risks? The answer is an unequivocal YES! The benefits of team sports — socially, emotionally, and physically — are well-documented and significantly outweigh the risk of injury. So go forth and encourage your child to participate in a sport. And know that you can have a role in making youth sports safer for every child — no matter where you live or in which sport your child chooses to participate.